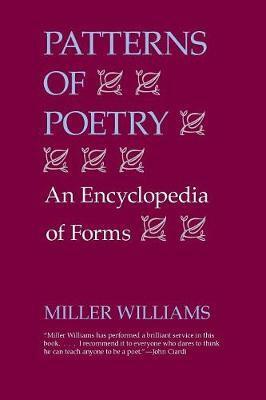 Miller Williams' Patterns of Poetry is an encyclopedia of the forms used by poets throughout the history of English, from blank verse to hymnal measure, from englyn penfyr to the double dactyl, from the clerihew to the sonnet. Each form is introduced with a brief discussion of its origin, which is followed by a graphic presentation of its scansion, metrics, and rhyme scheme. Sample poems show how each form actually works. Williams begins Patterns of Poetry with an introduction entitled "Form and the Age," in which he traces the history of form in the arts and the ways in which any form relates to the political, social, and religious temper of the period in which it becomes dominant. He then prefaces the main text with useful notes on rhyme, prosodic symbols, the major feet, metrics, and nonce forms. Also included in the book are a glossary; a bibliography; a listing of additional poems in the various patterns (poems not included in the text but of great use to teachers); an essay on the line as the prosodic unit; and an index. Miller Williams is the author, editor, or translator of thirty-four books, including fourteen volumes of poetry, and Making a Poem: Some Thoughts about Poetry and the People Who Write It. Among his many honors are the Amy Lowell Traveling Scholarship in Poetry from Harvard University, the Poets' Prize, the Prix de Rome for Literature, and the Academy Award for Literature, the latter two both from the American Academy of Arts and Letters. He was inaugural poet for Bill Clinton's second swearing-in as president, and he is the father of three-time Grammy Award-winning singer and songwriter Lucinda Williams.